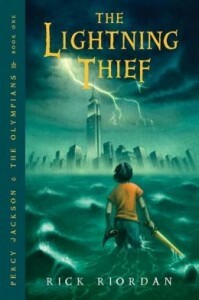 The Lightning Thief is the first book in the Percy Jackson & the Olympians series. In the roughly 15 years since the publication of Harry Potter and the Philosopher’s Stone, there have been several books or book series that have been called “the next Harry Potter.” Of the ones I’ve read, most have fallen short of the bar that phrase establishes. However, I think that if the Grasshopper or the Munchkin ever have kids of their own, Percy Jackson will be a character of childhood fiction ranked alongside Harry Potter, Charlie Bucket, Milo, and Mr. Toad. Percy Jackson ends 6th grade with lots of unpleasant things, including strange events involving his math teacher and getting kicked out of his sixth school in as many years. Thanks to his stepfather, he has an absolutely miserable time during the brief few hours at home before leaving for a short trip to the beach with his mom. A combination of storm, nightmares, monsters, and an unexpected visit from one of Percy’s few friends from the last year of school cut the trip short and start them driving toward a camp on Long Island. At camp, Percy learns that he’s a demigod, son of one of the Greek Olympian gods. After dealing with some new-kid camp stuff, his father (Poseidon) officially recognizes him, which results in Percy being handed a prophecy and a quest to go recover Zeus’ master lightning bolt and return it to New York City before the summer solstice, 10 days away. Thus begins a cross-country trek complete with monsters, being named as a wanted criminal on the news, and arm-twisting bribery with one of the gods. It ends with a revelation that there are bad guys manipulating bad guys, and leaves itself wide open for a sequel (since this was planned as the first book of five). Percy’s stepfather is, to say it nicely, not a paragon of exemplary behavior. During his brief appearance “on-screen” he’s verbally borderline-abusive to both Percy and his mom. (In my opinion, he’s over the line, but yours might vary.) There are also some indications that he may have been physically abusive to Percy’s mom when Percy’s gone, but I remember these as being subtle and something that younger tweens are unlikely to pick up. Note from Amanda: Please see the comments, where a few more things are pointed out about this and also about Percy’s mom pretty much being dead for a good portion of the book (she gets rescued from Hades in the end). There’s some irreverent humor throughout the book, especially in the chapter titles (e.g. “Grover Unexpectedly Loses His Pants”). It’s less omnipresent and less obnoxious than the Captain Underpants books, but it’s there. Possibly more noteworthy is the frequent use of “Oh, my gods” as an exclamation by characters. It’s plural, and readily recognizable as such in the audiobook edition but might be easily missed by rapid readers in print. Some of the encounters with monsters, especially the Furies and Echidna, are a bit intense. The latter in particular has Percy diving out of the Gateway Arch and into the Mississippi River, expecting that he’ll be hurt very badly. Since this series is narrated first-person, it’s pretty intense for a few pages. If you are a person who objects to Harry Potter on the grounds that in those books magic is real, potentially used for good, and explicitly non-Christian, I doubt that you’re reading this review. 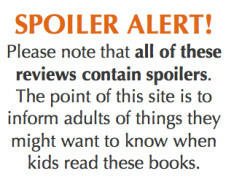 However, if you are, you definitely won’t want your kids reading any of the books Rick Riordan has written for kids. The entire series starts from a supposition that non-Christian gods are real, have power, and can do good things for the world. All of the important characters in the series act in ways that are entirely consistent with that premise. This is definitely something I’d recommend to anybody whose kids have read all of the Harry Potter books and want something similar in flavor. 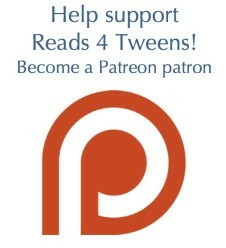 It will also work well if there’s a mythology unit as part of an older student’s language arts classes, since many events throughout this series are modeled after parts of Greek myths, and Percy himself remarks about his mom having named him for the only demigod to get a happy ending. As is my custom, if I’ve both read and listened to editions, I’ll not specific qualms here. In this case, it’s that, over the course of the series, although the narrator keeps the main characters’ voices consistent, those of other characters are different enough that if you listen to them in a row (as I did when making sure they were OK for the Grasshopper), the differences stand out and are a tad jarring. It’s only an issue through the audio editions of the first 5 books, as they change narrators for the second series and he doesn’t have this issue. Actually, Percy explicitly states, “That jerk has been hitting you.” So, yeah. Safe to say there’s some physical abuse going on. Probably also worth mentioning that Percy’s mom appears to die early on in the book. She literally dissolves in the hands of a raging minotaur. Oddly, Percy barely mourns her. And she does reappear at the end (they bargain with Hades for her soul), but for a good 300 pages or so, she’s dead. 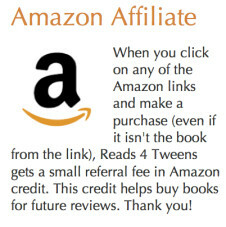 Which might be of concern for the youngest readers. Thank you for adding these observations!